When you have a communications problem, need inspiration or want to learn something new, you need a place to go. That’s why I created this collection of resources. They have helped me over the years and I return to them often. This is a page made for you to print, share and come back to. Let me know if you can’t find what you need in the comments and I will do my best to find something that will help you. It also helps me update the page which I do regularly. Or if you’d prefer send me an email. I also recommend subscribing to my newsletter for fresh content that might not make it to this page. Advertising 101: A guide to getting the most from your advertising dollar. Covers what is advertising, telling the agency what you want, why you need a single idea, how much ads cost and how to save money. Briefing your ad agency: A best-practice guide on how to brief an ad agency to save time and money and get the ad that serves your objectives. Based on research conducted with 140 advertisers and agencies. Single-minded proposition: An effective advertising technique to highlight your product’s key strength or asset. 20 mistakes to avoid when rebranding: Rebranding is a tricky process. These 20 questions will help ensure you have the bases covered in a rebrand. Building a brand from scratch: If you need to develop a brand I recommend you get a branding company to guide you through the process. If you can’t afford that this is a good overview for creating a brand that is good for your business. Creating great product or company name: A naming guide that demystifies the process of creating a great product or company name. Why rebranding is hard: Rebrands are difficult. This explains some the difficulties you’ll experience in a rebrand and three things you can do to make it through unscathed. Advertising Age: Online version of the well-known publication. Features a number of blogs. There is a lot of content published daily so it can be hard to keep up with. If you were to subscribe to one feed I recommend ‘Best ads’. ProBlogger: Articles written by successful bloggers on how to blog and build an audience. Bad Language: Matthew Stibbe is a writer, journalist and marketer. He covers a wide range of topics including tips for public relations professionals, aspiring journalists and freelancers. Daily Writing Tips: This is a favourite site of mine. I read every article as it comes through. It includes everything from synonyms to grammar, punctuation to book reviews. A website every writer should know about. Positive Writer: A good site to visit if you’re struggling for motivation or that first draft that seems impossible to write. Write to Done: An excellent blog covering the ins and outs of writing. Covers a broad range from copywriting to novels. Brain Pickings: A human-powered collection of cultural curios including history, politics, psychology and technology. ‘The adverb is not your friend’ is a highlight. Buffer: Buffer is a great tool for scheduling your social media updates. But the staff also keep a great blog. Covers social media, life hacks, writing advice. Communicate: A digital magazine I curate. New articles added every day covering communications. Can be read on iPad, iPhone, Android and online. Letters of Note: A fantastic collection of letters written by famous authors, fans and infamous whingers. OneLook reverse dictionary: Know what you want to say but can’t think of the word? This reverse dictionary does an excellent job of doing the heavy lifting and giving you the word you’re looking for (or perhaps a better one). Online Etymology Dictionary: Documenting the origins of words in the English language. A handy resource if you want to know what a word meant or how it sounded hundreds or thousands of years ago. Punctuation tips: How to properly use dashes, hyphens, parentheses, quote marks (double and single), apostrophes, ellipses, brackets, slashes, question marks, and exclamation points. Urban Dictionary: Our language is constantly evolving. Urban Dictionary now has over 7 million definitions making it an essential tool for any writer. Visuwords: A dictionary to visualise words, find their meaning and see how they relate to other words. Test your vocab: Most adults know between 20,000 and 35, 000 words. If you’ve ever wanted to know the size of your vocabulary this is the site that will tell you. WordCount: WordCount ranks the top 88,000 words in the English language. How many words do you get to before there’s one you don’t know? Avaaz: Avaaz sends its email newsletters to 25 million people. Subscribe and copy what they do. They test everything. If you do nothing else, do this. Email best practice: A handy infographic on email best practice including: names. layout, copy and things to avoid. Mailchimp: MailChimp offer the best software for email marketing. And their resources page is a great thing to bookmark even if you use a competitor. I send my monthly email using Mailchimp. I recommend subscribing — of course I do! Thirteen techniques journalists use: Journalists know how to draw out responses that make for good stories. These tips can be applied outside journalism. Drew Westen — The Political Brain: A fantastic book on persuasive communication. Intended to help progressives communicate in stories, connect to emotions and win. George Lakoff — Don’t Think of an Elephant! : If you’ve ever wondered why conservatives keep winning debates, this is the book to own. A 120 page book on how it happened and how to fight back. The Forest of Rhetoric: Forest doesn’t do it justice. This is a swathing mass of rhetorical terms compiled by Dr. Gideon Burton of Brigham Young University. Intended for beginners and experts. An excellent example of crisis communications: When Asiana Airlines flight 214 crashed at San Francisco Airport, Deborah Hersman was able to get across vital information in a clear, concise, and controlled manner. 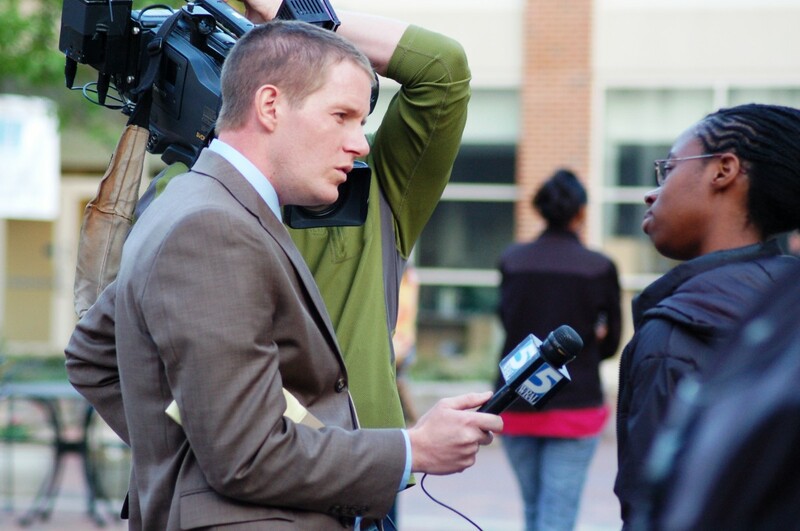 Media Angle tip sheets: Dealing with the media can be difficult. This is a series of tip sheets from an ex-ABC journalist on how to deal with the media. Pitching your story or op-ed: If you have a story to pitch to a news or opinion editor this is a good article to read. 17 tips from an editor of The Atlantic. Success in Media videos: A large collection of short videos on interview techniques. Covers everything from ums and ahs to press conferences, from using stories to using your voice. The Oped Project: An enormous resource on the art of writing and pitching opinion pieces. Tips for writing opinion pieces: A fantastic guide to writing and pitching an opinion piece (or op-ed). It does have an Australian focus but the advice can be applied anywhere. Presentations skills from Mad Men: Five presentation skills taken from the advertising industry and Mad Men. AllTop: A collection of the best sites and blogs that cover a specific topic. Topics have their own page which also has its own feed (for example http://writing.alltop.com/). Delicious: A bookmarking site that stores links online for longevity. And thankfully no longer owned by Yahoo. Feedly: The best service I have found to read the feeds I subscribe too. I switched to Feedly after the demise of Google Reader. You can read online or via the iOS and Android apps. Readability: Beautifully designed apps for reading content you saved for reading later. I use it primarily for reading long-form journalism that I want to come back to. And their ‘Send to Kindle’ bookmarklet is brilliant. Reeder: My preferred way to read feeds on the iPhone. The Mac and iPad apps are currently being updated to work with Feedly. American Rhetoric: An essential resource for speechwriters. The site has a fantastic archive of the world’s most memorable speeches and some forgotten ones. There is a handy collection of rhetorical devices to help you add some zing to your words. Death to the Stock Photo: Free high resolution images sent via a monthly newsletter. Free Refe: A marketplace of the best free mobile images. Can be used commercially. Freerange Stock: A decent selection of free stock photography. Requires sign up. Gratisography: Free images that can be used for commercial projects. The quality of the images are amazing, but hard to find if you have a specific images in mind. Little Visuals: Email-based subscription. Seven images sent every seven days. New Old Stock: Image with no copyright restrictions harvested from public archives. Picjumbo.com: Free images organized by category. No registration required. Premium accounts if you need more images. Superfamous: Decent quality images. Lots of abstract images. The Pattern Library: A lovely site to use. Full of interesting textures and patterns to add some punch to your design. Unsplash: 10 Free images delivered to your inbox every ten days. The science of storytelling: Stories turn people into participants rather than observers. They mould our thinking and behaviour. A quick dip into the science of storytelling. The danger of a single story: A powerful video one why a single story can be dangerous. Chimamanda Adichie tells the story of how she found her authentic cultural voice. Pixar’s 22 rules of storytelling: Pixar tell wonderful stories. Here are their 22 rules that help you construct a narrative. Three reasons to master the art storytelling: In a nutshell: recall, sharing, action. The article is intended for startups but the principles can be applied in any business or organisation. The story spine: A narrative tool created by playwright, Kenn Adams, that can be used to help create stories beyond the personal narrative suggested in the article. The story test: Test whether you know what makes a story. Transom: A great resource to help you master the power of story and the tools to do it. Of most benefit for people submitting radio stories and podcasters. Scrivener: Scrivener is an amazing writing tool. It makes the sometimes messy process of writing easier and quicker. It helps with everything from the research phase to publishing. I use it all the time, and it’s great for speechwriting. Windows and Mac. Textarea: Trying to copy from Word to another program and hate what you see? Yeah me too. Paste it into Textarea to remove Word’s formatting. Then copy the clean text. Up-Goer Five: I don’t understand the name but this is a great online tool for helping you simplify your writing. It limits you to using the 1,000 most-used words in English. It might be harder than you think. WriteRoom: Distraction-free writing tools are pretty commonplace these days. But WriteRoom is still the best. For Mac, iPhone and iPad. Thanks for this great resources. Bookmarked! Great collection. Any chance you can add a few more advertising resources? It’s a new part of my role and I’m trying to learn as much as I can. Thanks.